It’s not so long ago that I started my affair with this pot of heavenly bliss. We crossed each other’s path in the least expected circumstances. I have been on and off a “low carb diet” for about 2 years now. It was during one of those “I’m strictly on diet” phase that I hesitantly succumbed to the temptation of fresh cream. I was suggested to use cream in moderation, to substitute milk in my coffee and the rest is history. I started enjoying my creamed coffee and our association stood the test of times. Though I am officially off my diet , I haven’t completely come off my obsession with cream in it’s numerous forms. 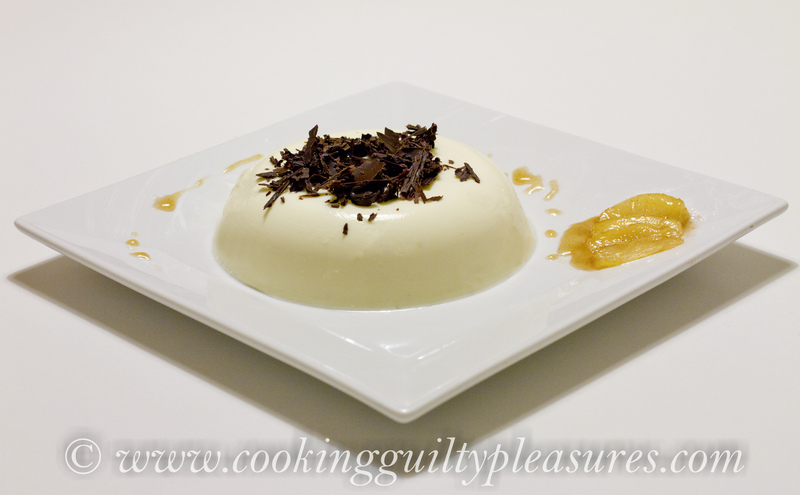 When one is, oh so much in love with fresh cream how can one possibly miss panna cotta – the Italian cooked cream dessert. This one’s for all those who want to charm their loved ones with this simple yet delicious creation. For the Panna cotta , split the vanilla pod lengthways and scrape the seeds out. Soak the gelatine leaves in about 2-3 tbsps of cold water until soft. If you are using a vegetarian substituent of gelatine follow the instruction on the pack. Place the milk and cream in a heavy bottomed pan and bring to a simmer. When the cream mixture is warm add sugar along with the vanilla pod and bring it to boil. Remove from the heat and add the dissolved gelatine into the cream mixture and mix thoroughly until it’s smooth and thickened. Pour the mixture into individual ramekins or a mould of your desired shape. Leave it to set in refrigerator for a minimum of 3 hours. For the glazed pears, melt the butter in a frying pan over a medium heat. Add the pear slices and fry until both the sides are slightly browned. Add lemon juice , powdered cinnamon and sugar , stir well ensuring all the slices are coated in sugar and cook until the sugar is completely dissolved forming a nice brown syrup. When it’s ready to be served unmould the panna cotta onto serving plates. To ease unmoulding dip the ramekins in warm water briefly before you turn out onto serving plates. To add that extra wow! factor to this sinfully delicious dessert shower a generous amount of chocolate shavings on the top and serve it with the glazed pears on the side with a drizzle of the syrup left in the pan.